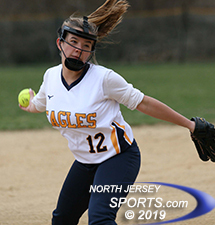 Emily Toresi scored the run that tied the game at 2 for Mary Help of Christian, which went on to win its first ever season-opening softball game, 3-2, over Eastern Christian on Tuesday. WYCKOFF – When trying to build a program teams at the bottom of the league standings often have to take their lumps. but no team in New Jersey softball took its lumps quite like Mary Help of Christians has over the past decade. When Bryonna Richburg, Natalie DeCindio, and Jaylen Rodriguez stepped on the field as freshmen they were in the midst of an unfortunate losing streak that grew to 99 straight losses before finally winning in the season finale. The Blue Jays fed off the snapped losing streak to move the program in the right direction. They finished with four wins in 2017 and then seven wins last year. Heading into this season the goal was to not just be competitive, but to learn how to win close games. A gritty effort all-around led by Richburg in the circle and at the plate, sent the Blue Jays to new heights. They scored once in each the sixth and the seventh innings before a pair of stellar defensive plays from third baseman Alyssa Cogdell locked up the first season-opening win in the program’s history as Mary Help came from behind to beat Eastern Christian, 3-2, at Eastern Christian Middle School in Wyckoff. Eastern Christian got on the scoreboard early with both of its runs coming in the opening frame. Alex Griffin doubled home Kate Van Olden with Griffin moving up to third base on the throw home. Then on a hard hit ball back to the box Richburg did not hold Griffin on long enough at third with Griffin beating the throw to the plate to give the Eagles a 2-0 lead. It was Richburg’s first and last miscue of the afternoon. 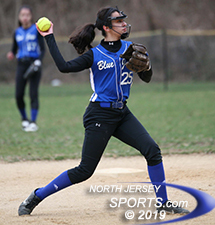 Elizabeth Lopez pitched well for Eastern Christian as she scattered five hits and struck out nine without walking a batter. Mary Help got one of those runs back in the top half of the fourth inning. DeCindio reached on an error, stole second, then went to third on a wild pitch before Richburg hit a rope into right-center field for an RBI triple to cut the lead to 2-1 and put the tying run just 60 feet away. Eastern Christian right-hander Elizabeth Lopez settled down and got back-to-back strikeouts to preserve the Eagles’ lead. After a rough first inning Richburg got into a rhythm by throwing first-pitch strikes. She retired eight batters in a row at one point and also got some help defensively. 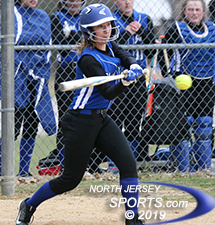 DeCindio was solid at shortstop and a pair of running catches by left fielder Valerie Jachimski helped keep the Blue Jays within striking distance. But as innings went by they headed into the sixth inning looking for that elusive tying run. With the top of the lineup coming to bat in the sixth, this was the Mary Help needed to make something happen. Leadoff batter Emily Toresi lined a single then stole second before moving up to third on a groundout by DeCindio. After a strikeout for the second out of the inning, the Eagles elected to pitch to Richburg with first base open. The senior wasted no time in lining the first pitch she saw back through the box to bring home Toresi and tie the game at 2. The score remained that way heading into the top of the seventh inning with the bottom of the order coming up. None of those players reached base in their previous two at-bats but they saved the best for last. Rodriguez reached on an error followed by a Jachimski single. No. 9 batter Raquel Jacquet nubbed a pop-up off the end of the bat that landed in the perfect spot between the pitcher and the catcher to reach safely and load the bases with one out. Lopez then made a nice play on a hard-hit ball up the middle by Toresi. However, Rodriguez got a great jump breaking for the plate and Lopez had no choice but to throw to first for the out with Rodriguez coming across for the go-ahead run and a 3-2 lead. Natalie DeCindio helped Mary Help of Christians become 1-0 for the first time in program history. Cogdell struck out in all three of her plate appearances but she did not let it affect her play in the field. On a pop-up in foul territory leading off the bottom of the seventh Cogdell, a sophomore third baseman, went all-out sliding into the fence to make a fantastic catch. Then with the tying run on base and two outs, Cogdell made a backhanded stab down the line and a strong throw to first for the final out of the game as the Blue Jays celebrated a new era. Richburg went the distance allowing four hits with one walk and four K’s along with a 3-3 day at the plate for Mary Help of Christians (1-0). Lopez pitched well for Eastern Christian (0-1) despite taking the loss. She scattered five hits and struck out nine without walking a batter. Just three years ago Mary Help of Christians had just three hits combined in its two games against Eastern Christian, losing by a combined score of 20-0. Now with a landmark win for the program, the Blue Jays have their sights set on possibly qualifying for county and state tournaments in the same year for the first time in school history. There is still a long way to go but head coach Davida Gotha-Ostrander wants them enjoy this feeling before getting taking the field again today against Elmwood Park.